I think I love Christmas almost as much as Buddy the Elf. You can pick the print above right here. So it should come as no surprise that all of my Friday Favorites are of course Christmas related. 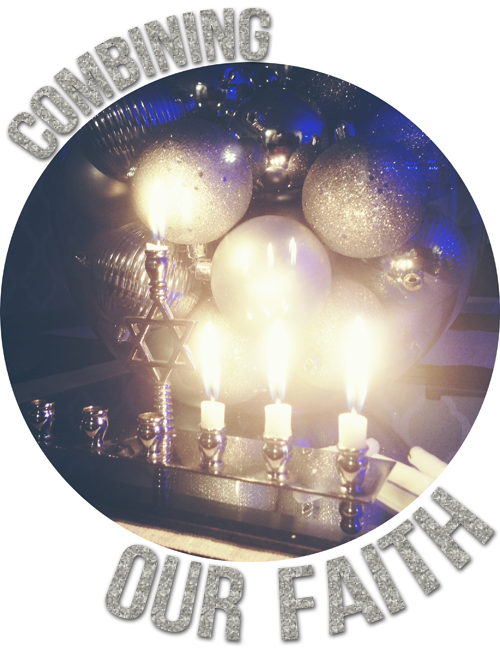 Check out the best of my blogoshpere this week and have yourself a Merry little weekend. We all have gone a little crazy with the adorable paper straws. 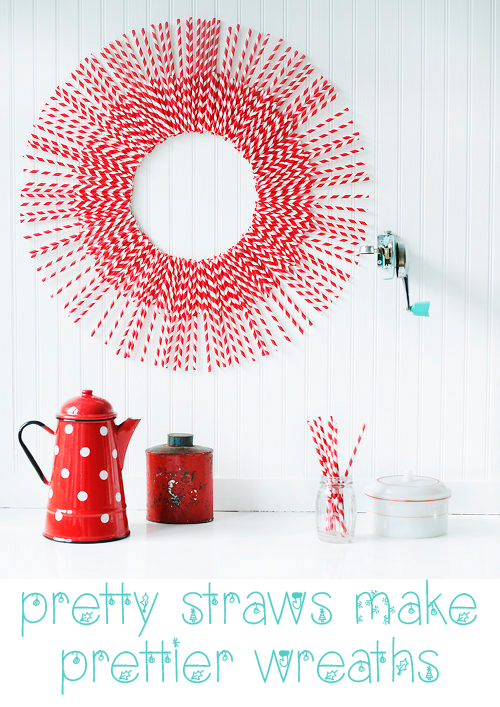 Over at Design Sponge they came up with an adorable craft to put those straws to work. This would be cute all year around and I have some gray straws calling my name. 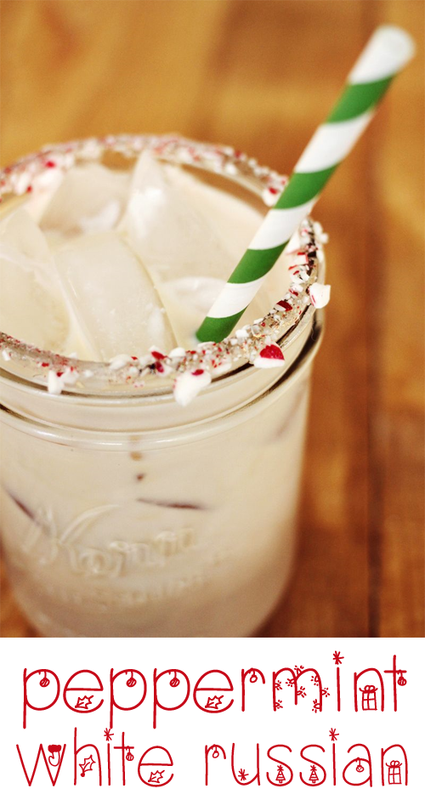 I do love a good drink…throw a holiday theme in there and I’ll take ten. The awesome girls over at A Beautiful Mess are always making sweet goodness, and this drink seems just right for the season. 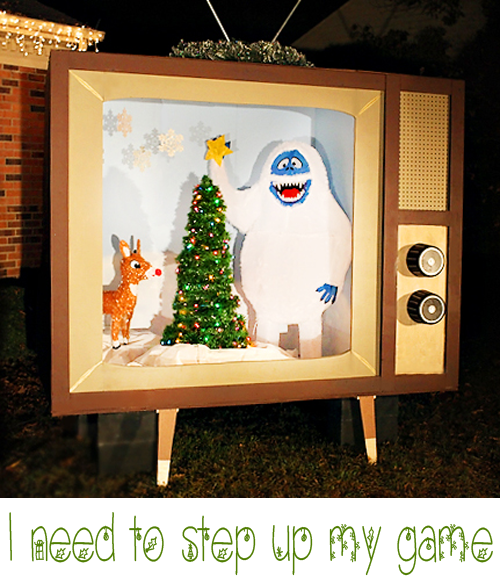 Can you believe Ashley & Greg from 7th House on the Left actually made this vintage tv to put in their front yard. I need to really step up my yard decor to keep up, that thing is the size of my garage. I’m beyond impressed. I have been debating for weeks how to wrap my presents…although I am having a change of heart on what I am getting everyone which would be a total game changer. 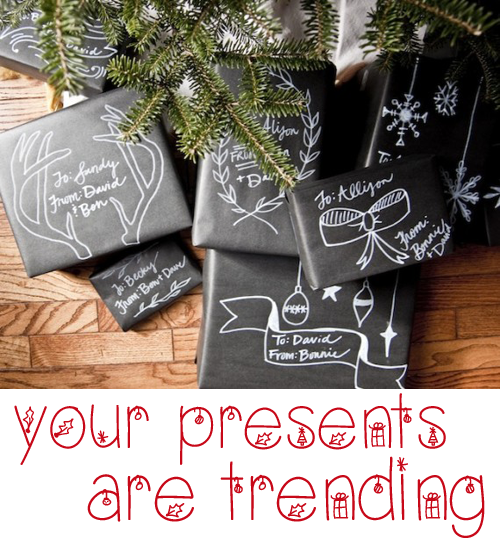 How cute are these chalkboard presents the Bonnie made over on Going Home to Roost. If only I could doodle as cute as her. 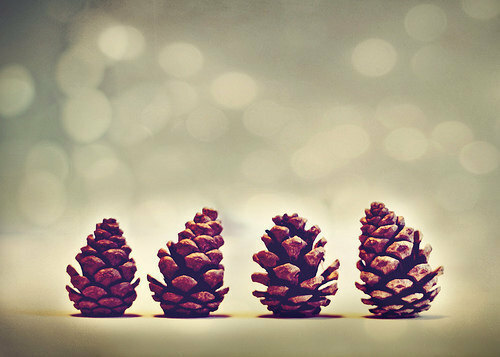 What gorgeous holiday inspiration have you come across this week? If you share below I will make sure you are on the “nice” list. 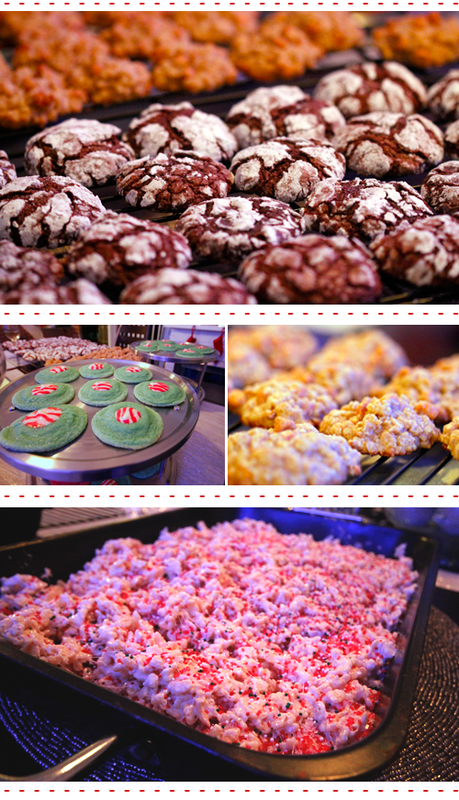 As I mentioned last week, I hosted my first cookie bake this weekend. For as long as I can remember my mom has gotten together with a few of her oldest friends -and by oldest I mean they have been in her life for many moons…not that they have wrinkles-and baked cookies. I always loved this time of year because it meant a delicious sample session of sugary goodness. I always secretly wondered why I wasn’t invited. But now I get it…If kids were there then they couldn’t lick the bowls. You’re totally forgiven mom. This year I decided to take matters into my own hands and start hoarding sweets, not good for my thighs but I’ll totally take the stairs all week. 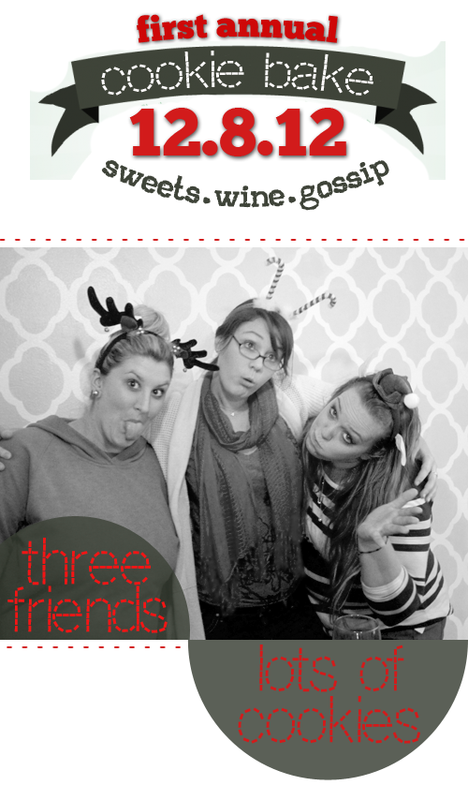 Here are a few of our treats… We had a blast, just catching up and trying our best not to burn anything. I really hope we can make it an annual get together. Not only do you get to spend time with fun girls, you get cookies too! Have you ever had a cookie bake? Got a good recipe I need to know? When Tim and I decided to partake in this little game called love we never gave much thought as to how to blend our religions. We were more concerned with making sure our breath didn’t smell and that we didn’t misuse grammar in texts. These days…we are focused on bigger issues. Tim grew up celebrating Hanukkah and I grew up with dear old St. Nick. We had both been exposed to a variety of religions thanks to our awesome parents. Now we are finding that magical balance celebrating both holidays. I have found such joy in sharing our traditions with one another. And ladies…find you a boy that speaks Hebrew…it’s awesome. We are both so accepting of one another and we both get equally excited about learning about the other holiday. I would say I get more excited about Hanukkah, because Tim has been exposed to Christmas through the years. Before everyone gets all excited about how we will raise our kids and if the pups have dreidels please understand that we are both super open-minded. For us our religion is more about our relationship with a higher being…and yes the dogs totally howl the dreidel song. Have you ever dated someone with different beliefs? A different culture? How have you blended these parts of your lives together? We love advice. Holler for the weekend y’all. Do you have any big plans? I am hosting a cookie bake with a couple of old friends. Think lots of wine and convincing my pregnant best friend – who will not partake in the wine consumption – that her little boy needs this. Seriously, how adorable would that be in a kids room? 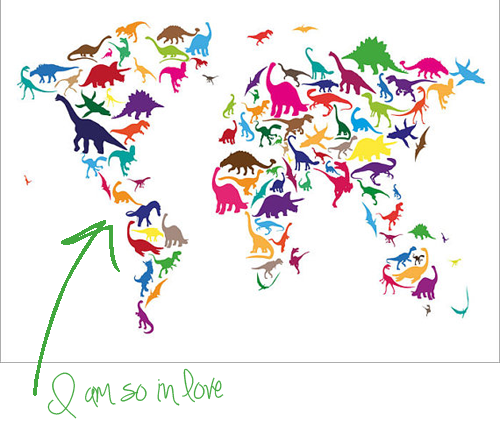 I mean a map AND dinosaurs…it couldn’t be any cooler. Want to know what else captured my heart this week…well since you asked. I am totally dumbstruck by this dining room. 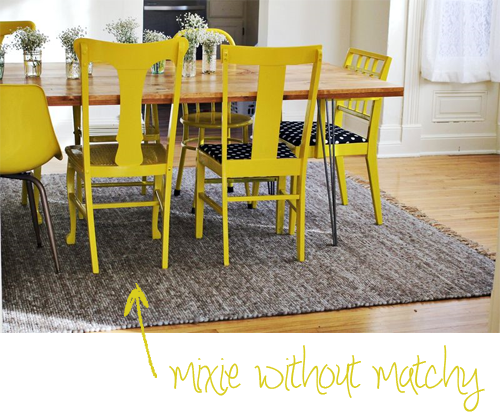 Why have I never thought of taking different chairs and painting them all the same color like they did over at A Beautiful Mess. It just works….and now I am collecting chairs. 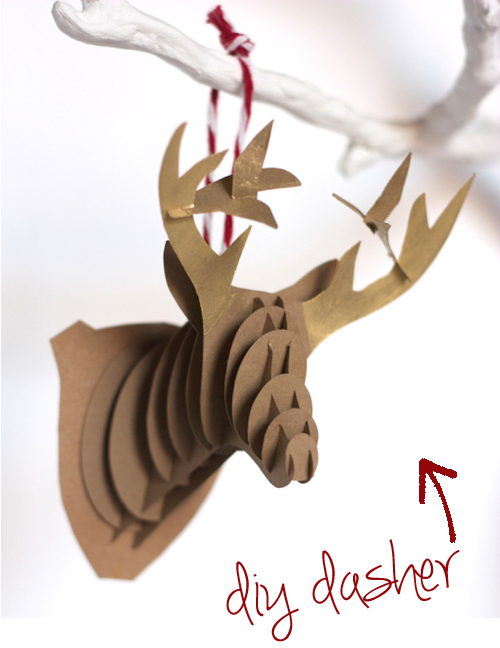 I am really nervous about making my own reindeer ornament, but Miranda from One Little Minute makes it look so easy. 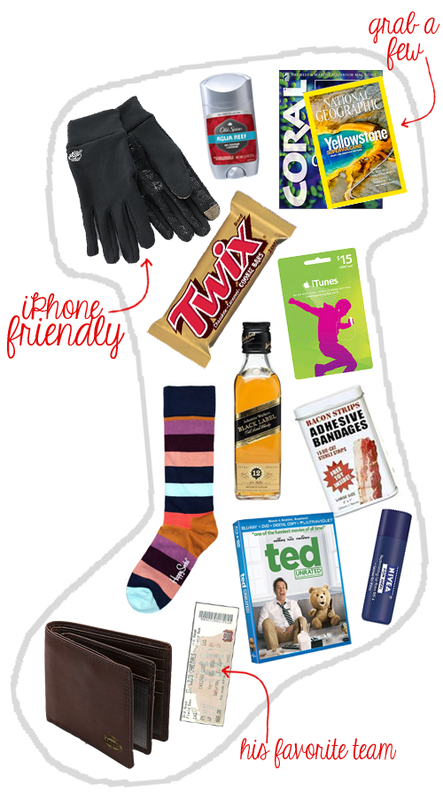 If you get these as a gift this year, well you can thank Miranda. You know how you always hear things like, “Today is mustard appreciation day, enjoy”. 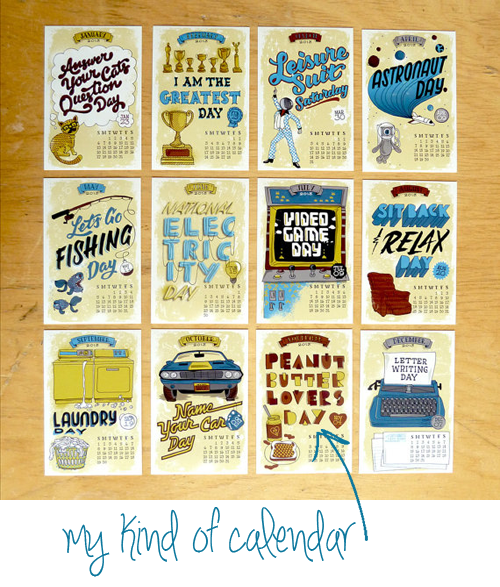 Well here is a whole calendar devoted to those quirky holidays. I am all about that Peanut Butter Lover Day…I think I will throw a party next year. 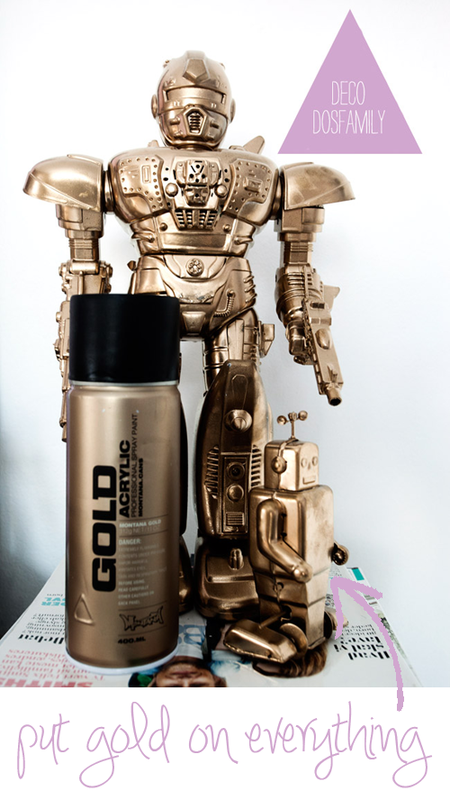 Isn’t everyone jumping on the gold-lovin train these days? How about taking something totally unexpected. Like your child’s broken robot and making it all fancy like they did over at Dos Family. So glam…so unexpected. 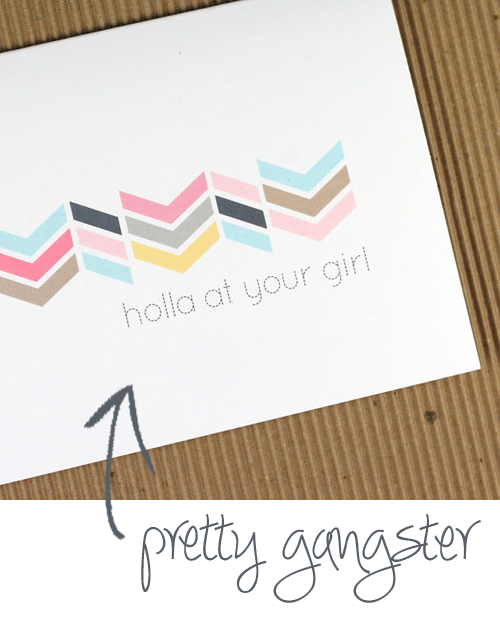 My best friend forever blogger friend Roo just launched an awesome line of paper goods…and gangster notebooks. Buy them all because they are almost as awesome as she is. Holler. Did you read an inspiring article? Find the best DIY project?